Windsor and Eton  are twin towns, in Berkshire, in the South East of England, separated by the River Thames and joined by Windsor Bridge. Contact the Royal Windsor Information Centre for further information on attractions, events, places to stay and things to do. +44 1753 743900. Heathrow Airport  is about 8 miles drive straight down the M4 (westbound) motorway. Alternatively the First bus route 77  and First bus route 71  both connect Heathrow Terminal 5 and Windsor, the former quicker routing via Slough and the latter via Staines. They both leave approximately every half hour taking about 35 - 55 minutes. Gatwick Airport  is about an hour's drive away via the M23 (northbound), M25 (clockwise), and M4 (westbound) motorways. With no through train or bus service, your best bet by public transport is to take the train into London and then follow the directions under Get in By Train below. Stansted Airport  is about 90 minutes drive away via the M11 (southbound), M25 (anti-clockwise) and M4 (westbound) motorways. With no through train or bus service, your best bet by public transport is to take the train into London and then follow the directions under Get in By Train below. In Windsor and Eton there are two railway stations  (0845 748 49 50). Both stations are within walking distance of each other and Windsor Castle. Assuming that you will be coming from London the choice of which route to use probably comes down to how far from Waterloo and Paddington stations you will stay. Depart from the nearest. 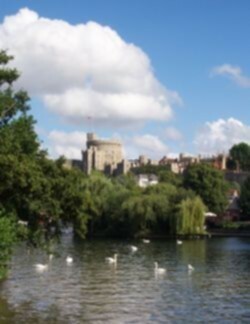 From London Waterloo take any train to Windsor & Eton Riverside (two per hour, journey time approximately 1 hour). From London Paddington or Reading take any train to Slough. Change at Slough for the connecting rail service to Windsor & Eton Central. Off peak fares (available if travelling after 09:30 on a weekday, or at any time at weekend) are shown below. Return fares are more expensive if travelling in the peak period. Alternatively, if you do not mind mixing and matching tickets, or getting blank looks from ticket selling staff (you can avoid this by buying the tickets at the machine), you can lower the costs of the journey by buying a ticket from PAD to WAT (or vice versa) via Windsor [All Stations]. A single ticket (which in fact covers a return journey) costs £5.30 - Warning: You should only use this option if you do not mind departing London from one station and returning to another. If you include the Underground in your ticket, it costs only £4.30. For example, starting/finishing your journey at Marylebone (for the PAD part) or London Bridge (for the WAT part). You can get this ticket for as little as £2.80 if you buy it for early morning hours, but then you may have to use private transit for a part of your journey in London. If you buy a single ticket from PAD to WAT via Windsor [All Stations], you should depart from PAD, change at Slough and arrive at WNC. For the return journey, you should depart from WNR and arrive at WAT. If you buy a single ticket from WAT to PAD via Windsor [All Stations], you should depart from WAT and arrive at WNR. For the return journey, you should depart from WNC, change at Slough, and arrive at PAD. From London (Buckingham Palace Road, Victoria): Greenline  coach 700/701/702 (journey time approximately 1 hour). From London (Heathrow Airport): First  77 (journey time approximately 40 minutes). Windsor is served by the M4 motorway (freeway) which runs from London to Bristol and South Wales. It is about an hour's drive from central London. The best junction to use is J6. Windsor lies on National Cycle Route 4 (London — St David's). If you are planning to do any visiting or exploring beyond central Windsor and Eton, you will probably want to obtain a decent map of the area. You should ensure that any map you buy clearly shows the national grid reference lines, and explains how to use them, as grid references are frequently used to indicate out of town locations. For driving or cycling, Ordnance Survey  Landranger 175 (scale 1:50000) covers Windsor and to the west, including all the places mentioned below except Runnymede and Ordnance Survey Landranger 176 (scale 1:50000) covers the area to the east, including Runnymede. For walking, Ordnance Survey Explorer 160 (scale 1:25000). Windsor has a reasonable bus service, both within the town and to the surrounding area, although frequencies can be quite low with little service in the evenings or on Sunday. First Berkshire , telephone +44 1753 524144, provides most bus services in the area. Traveline , telephone 0870 608 2608 from within the UK, provide an impartial online travel planner and telephone query service for all local bus services. Neither Windsor nor Eton is big enough to get really congested, although traffic delays can be severe on summer weekend mornings and evenings, when Legoland is popular, and on evenings when there is horse-racing at Windsor racecourse. One issue that you may find in driving around Windsor and Eton is that Windsor Bridge is for pedestrians only. To get between Windsor and Eton requires you to drive out to the Windsor by-pass, cross the river on that, then go most of the way into Slough before taking the old Windsor Road from that town back into Eton; it is easily quicker to walk. Windsor based website, walking.org, is ran by a group of keen local walkers and details a number of walks for holidaymakers . These places to see are a little further out; some are accessible by longer walks, others will require the use of car, bike or public transport. It is important to remember in Windsor that it is most definitely not a "clone-town". Therefore it does not offer an entirely Shopping Centre based retail experience. It is more based around Peascod Street (the high street), King Edward Court, Thames Street, Windsor Royal Station and St Leonard's Road. In this case it has many, many different mixtures of independent fashion boutiques such as Michael Chell, Coco etc; and of course large retail chains such as H&M, Monsoon and so on. It also has a variety of specialist retailers such as Molton Brown, Hotel Chocolat (extremely tasty handmade chocolate), Havana House Fine Cigar Merchants and Oil and Vinegar to name a few. There a far too many different shops that a visitor can step into, so they are not all named, instead take a walk through the places listed previously and enjoy the atmosphere of one of the most beautiful towns in England. There are lots of places to eat in and around Windsor & Eton, and a good way to find one is simply to keep your eyes open as you visit. The prices are estimates for a meal including drinks and tips. Windsor is a small, compact and cosy town, so you will need no taxi if you are thinking of going from bar to bar. Windsor is peppered with pubs, bars and a couple of clubs, some of these nestling neatly on the bank of the Thames, definitely worth a visit, especially come the summer months. They are expensive, though. There are a handful of venues to be found under the shadow of the Castle (Thames Street) most of of the chain variety. The cheapest place in town to eat and drink is King and Castle, if you happen to be skint, but all the venues on Thames Street are popular with Windsor's smartly dressed workers and picture happy cosmopolitan tourists. The arches (2 min walk) from the Castle are home to Windsor’s late night venues, clubs and style bars, most will requiringyou to be smartly dressed. Expect queues on busy nights of the week and higher than average drinks prices! The arches are well worth a visit, and the bars found here are housed inside old Victorian railway arches, which make them a really atmospheric choice and a great place to wind up or wind down, depending on your mood. The edge of town, bottom of Peascod Street, just 2 min walk from the arches, is where you’ll find Windsor’s affluent residents socialising, cafe culture is certainly alive in this part of town, and in the summer months, people spill onto the pedestrianised streets till very late seven nights a week. Itt is a great spot for people watching and unwinding from a day out. There is a good selection of restaurants to be found down here, probably the best in town, well worth the short walk. If you are looking to tap in the local scene and fill your belly this is where to go. Mercure Windsor Castle Hotel, 18 High Street, SL4 1LJ. Mercure Windsor Castle Hotel is ideally located if you plan to visit Windsor Castle. The hotel is just a few minutes' walk from the castle and grounds. There are many hotels in Windsor, some are right opposite the Castle, but do not expect cheap rooms from them. Contact the Royal Windsor Information Centre for further information on guesthouses, hotels and self catering accommodation. +44 1753 743900. There a lots of cafes, pubs and bars in Windsor with free Wi-Fi Internet hotspots. Windsor's area code (for landline numbers) is +44 1753 when dialled from outside the United Kingdom, 01753 from within. This page was last edited on 11 November 2017, at 16:17.